Click the photo for the full boys' schedule. 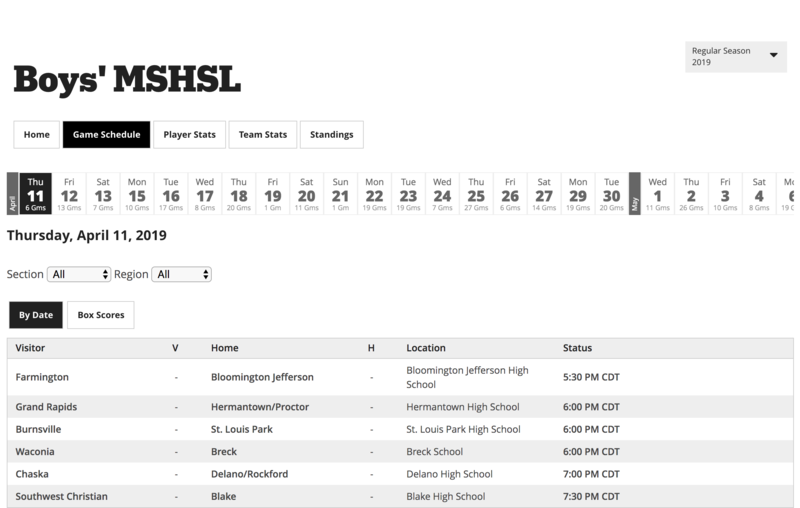 A link to the girls' schedule is below. This week's taste of spring is a preview for the 2019 lacrosse season, with boys' and girls' competition beginning on April 11. The sport's popularity in Minnesota has largely been tied to the metro area, where nearly all of the 15 games on opening day are scheduled, but one boys' outstate matchup holds plenty of allure. Grand Rapids and Hermantown/Proctor face each other after splitting close games a season ago. The Thunderhawks took the first game 6-4, while Hermantown/Proctor has held offseason bragging rights after earning a 6-5 win in the second meeting. Finding form and establishing chemistry is on every program’s itinerary early in the season, but for some, exacting a little revenge on a nearby rival is also on the mind. North Suburban Conference rivals Anoka and Andover met early last season and the Huskies fought for a 10-9 victory over the Tornadoes, prompting the Huskies to a 9-3 regular-season record, good for a third-place finish in conference play. Anoka, meanwhile, stumbled to just one league win. The Tornadoes will be looking for some revenge and an improved league record this season, beginning with the rematch on April 12. A state title game rematch is slated for May 4 when Benilde-St. Margaret’s visits defending champion Prior Lake. The Red Knights, who lost the championship game to Eagan in 2017, fell to the Lakers 10-8 in last season's finale, and are looking to get over the hump and hoist the tourney hardware. Prior Lake’s girls look poised for their own run towards a state crown, as the Lakers have assembled a challenging schedule to prepare them. They'll face South Suburban Conference rival and defending state champion Apple Valley on May 9. Apple Valley became the first girls' team to win a state title other than Eden Prairie and Blake in the Minnesota State High School League’s 12-year stewardship of the sport. And while the reign may be over for two of Minnesota’s most dominant girls' programs, the Eagles versus Bears annual regular-season finale on May 23 will still be a display of some of the highest level of girls’ lacrosse Minnesota has to offer. Click here for the full boys' schedule and here for the complete girls' schedule. Or go to the "Search" box at the top right corner of the page and type the name of your favorite squad into "Team Finder" for that team's specific schedule.